Supreme Court of India, upon hearing Senior Advocate Arvind Datar, Additional Solicitor General, Pinky Anand and Attorney General, Mukul Rohtagi have directed the Government to web-host the compilation of suggestions to improve collegium system and issue a public notice. The Court said that all those who desire to make suggestions may do so directly, on the website of Department of Justice, Ministry of Law and Justice, New Delhi. The court said that the suggestions received by 5pm on 13.11.2015 will be entertained. Suggestions are to be made in the four categories. Department of Justice is also directed to forward all those suggestions they received before the date aforesaid, to the concerned counsel for compilation. The matter is listed for a two day hearing commencing on 18th of this month. The Court also said that it will hear only those counsel who are shortlisted by a committee comprising of Attorney General, Bar Council of India chairman and Senior Advocate Fali S. Nariman. 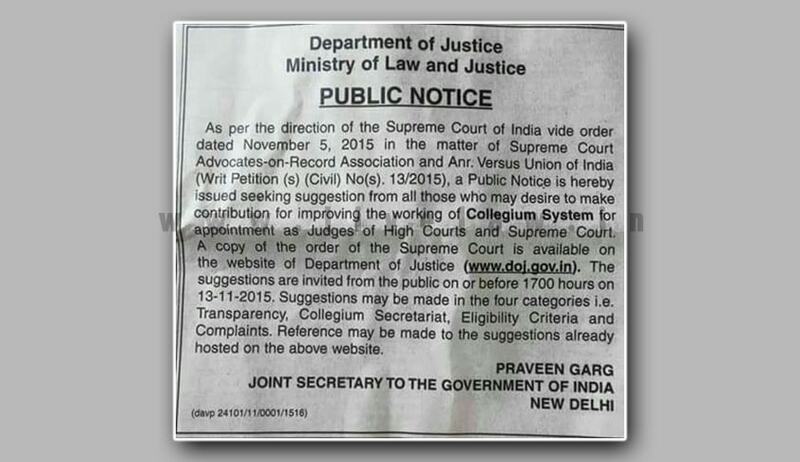 Department of Justice portal has requested the public to email their suggestions to collegium-suggestions@gov.in or collegium-improvement@gov.in. They have also published a Public notice inviting suggestions in newspapers. Additional Solicitor General Pinky Anand and Senior Advocate Arvind Datar had submitted a report compiling the suggestions they received from various association and individuals. The report says that they received over 60 representations from various associations and individuals.